Among fans of the C3 Corvette, the 1972 model, the last year that the Corvette featured a chrome front bumper, appears to be a firm favorite. 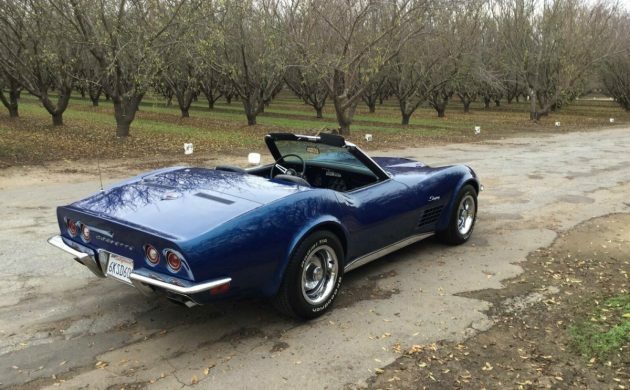 When you team that chrome with Targa Blue paint as featured on this Corvette, you are left with quite a stunning looking car. 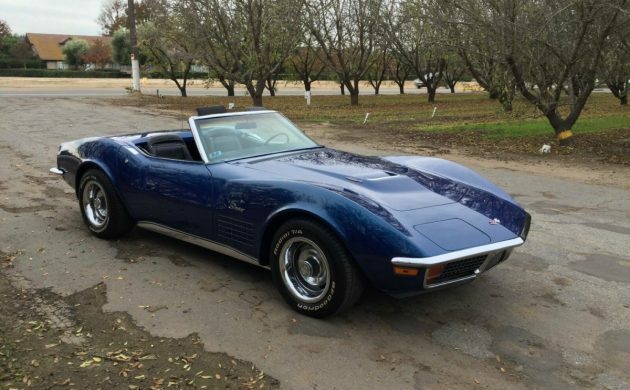 This truly lovely Corvette is located in Fresno, California, and is listed for sale here on eBay. The owner refers to the Corvette as all original, and if by this he means that the car has never undergone any restoration or repaint work, then this car stands as a testament to careful ownership. The description in the ad has been left wanting, so we have to rely on what we see in the photos. And what we see looks very nice indeed. 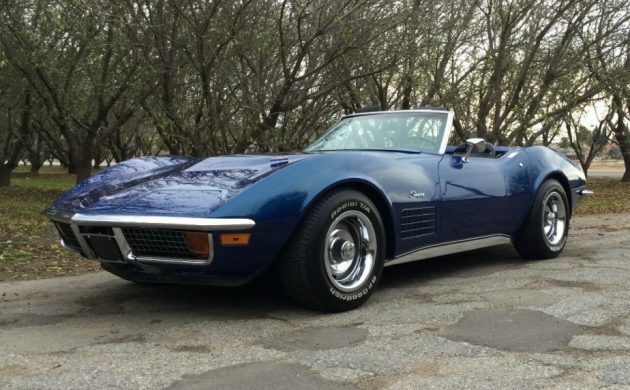 The 1972 Corvette was available in two different shades of blue, being Bryar Blue Metallic or Targa Blue Metallic. With 3,198 cars finished in Targa Blue, these cars outnumbered the Bryar Blue counterparts by a ratio of 2-to-1. However, in my personal opinion, the Targa Blue is a nicer color, and that darker hue compliments the chrome really well. The paint on this car looks really nice, with a wonderful, deep shine. It is really hard to find anything to be critical of, as the overall presentation is very nice. The car also comes with both a soft-top and a hardtop. By the time this Corvette was built, convertibles were taking quite a big hit in the new car market. As a result, Chevrolet was only able to sell 6,508 Corvette Convertibles during 1972. As with the exterior of the Corvette, the interior also presents incredibly well. The leather seats look to be in first-class condition, while there are no visible issues or problems with the trim or dash. The car has been kept original, so there are no aftermarket additions. The car is also fitted with power windows and air conditioning. 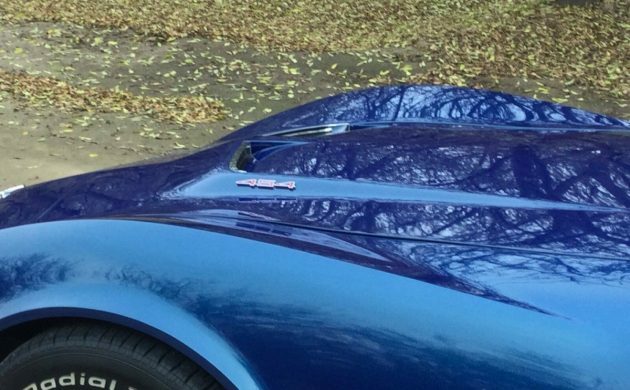 If there is anything to be disappointed about with this Corvette, it is the fact that the owner doesn’t provide any engine photos, so we’ll just have to muddle on with what we know. Under the hood is the 270hp LS5 454ci V8. This is backed by a 4-speed manual transmission. 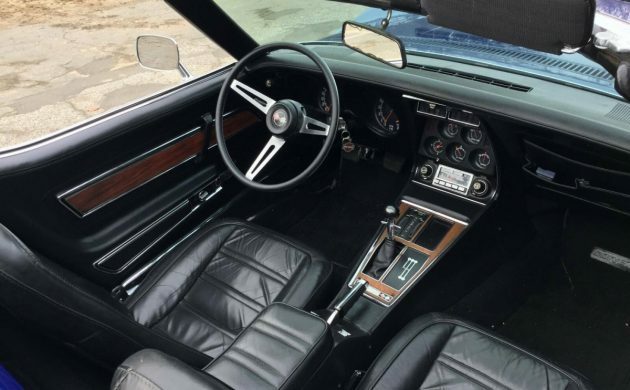 While there is little more that we are able to ascertain from the advertisement, it is interesting to note that 1972 was the first year in Corvette production where cars with automatic transmissions outsold manual examples. In that year, 54% of all Corvettes sold were equipped with an automatic. As Corvettes go, this is a very attractive looking car that is nicely equipped. There appears to be nothing to do but to climb behind the wheel and enjoy the ownership experience. It also appears to be inevitable that good Corvettes represent a solid investment opportunity, as the C1, C2, and C3 cars continue to experience a steady increase in values. At the time of writing, there are 40 people watching this particular car on eBay. The owner has set a BIN price of $45,000 for the car. Do you think that one of those people will take the opportunity to grab this one? Really looks like it just rolled out of the showroom! I like the blue and those chrome bumpers. I would like peek at the motor and the underside though. Ah memories. Through the early 90’s when I was around 7 until 12-13ish my dad’s summer daily driver was a targa blue 72 coupe. As an impressionable young boy I thought that car, in this same colour, was the most beautiful piece of machinery on the road. It was, and it still is, in your memories. Enjoy! If you are selling a convertible, you should always post at least one picture with the top up, if it has one. C3’s look better with the hardtop on. Convertible tops? We don’t need no stinking tops! If you are in sunny Southern California you don’t, but most everywhere else, they do. Fresno is pretty sunny and hot if I remember correctly. I like Corvettes but was never madly in love with them – until now. Gotta be worth $45K, doesn’t it? For $45K, some under hood shots, undercarriage indication of actual mileage and matching numbers would be nice, assuming that’s your thing. Well this cant be worth $45,000 ….. can it? Concours = $81,600 …. nope not likely that nice. Good = $38,700 ….. likely somewhere between good and excellent based on pictures. What’s this? O, the value adjustments section ……. let’s see here …..
and if it’s a close ratio 4 speed add another $1,000. I’ve now gone from thinking it was overpriced to thinking it may be reasonably priced. Ufda. Knows local dialect. Gets thumbs up. This is overpriced, at least until a LOT more information can be obtained. As mentioned in other comments, we need to know VIN, undercarriage condition, numbers matching, MILEAGE, the list goes on. What a lazy ad! At least when it comes to C3s, the Hagerty Valuation tool is optimistic. When I had my 70 convertible,I could only dream of getting the numbers that were quoted in that guide. Ad says right hand drive, mileage 1234. Nothing suspicious there. The Vin isn’t accurate either. Of all the C3s I’d take this one. Just look at it! Corvettes are and have always been “look at me” cars, mostly driven by guys who need them to feel good about themselves. That’s why I drive one. The ego gratification alone is worth it. That and the blistering acceleration, impeccable handling, heated seats, chrome wheels, paddle shifters, and the dark blue paint. And face it, the reason people drive Porsches and Hemis and Mustangs and BMWs is for the ego gratification. What other reason is there? Lots of people don’t like Corvettes and lots of people do. People who like Corvettes most certainly like this one. ‘The ego gratification alone is worth it’. I need no ego gratification. LOL! I have a 2000 Z3 and a 1972 Stingray that I have owned for 19 years. I beat them to death were no one see’s me. I cannot speak for the other owners, if you drive with a big head, fine. I also have a 1957 Willys Overland 4 by 4. So much fun. The reason people drive other rigs is because they are fun! So many rigs, so little time! Right, wrong or indifferent, the engine is the money shot: and there is none (picture that is)! Personally I don’t like BBC Vettes, but that’s a personal thing. Give me a SBC under the hood any day, they like those curvey roads much better IMO. Lovely car in a perfect color. Damn, the prices are getting out of hand. Nice car, but, I think a driver quality car with somewhere near 100,000 miles for half the price would be a better fit for me. Hear, hear! This car is great, though anemic by modern performance standards, of course. I drove a Hellcat and, well… I really might rather have this car, though. Too many memories. When you grew up in that time and have salivated over Corvettes since being a young boy, always thinking they were one of the very coolest cars out there, well, that trumps a lot of other considerations. Still, I’d bet I speak for a lot of folks when I say that this is, sadly, just out of reach financially. I’m with you George. Paid $4400 for a 71 coupe, in the early 90’s. One owner 4 speed. Pretty basic small block. Drove it for years until the Chicago rust ate it. Parted it out and made a couple of grand profit. Those were the days!